It is a Current Transformer for 1000A Ampere Meter,Secondary current Isn: 5A. voltage rating Ue:660 .. It is a Current Transformer for 2000A Ampere Meter,Secondary current Isn: 5A. voltage rating Ue:660 .. It is AC0.1~20A LCD Display Digital Ammeter Current Monitor/Tester, Working Voltage: AC80~500V 110.. It is AC 0~1.999A LCD Display Digital Ammeter Current Monitor/Tester, Working Voltage: AC80~500V 110.. It is AC 0~50A LCD Display Digital Ammeter Current Monitor/Tester, Working Voltage: AC80~500V 110V/2.. It is a AC 100A Digital Ammeter,Measuring range: AC 0-100A (need current transformer),small size, h.. 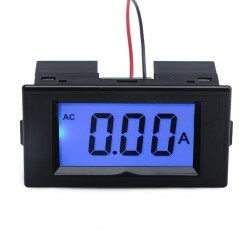 It is a Led Display Digital Ammeter + Current Transformer, Working voltage: AC/DC 8~12V, Current tes.. It is a 2in1 Volt Amp Panel Meter, Measure Voltage Range AC 80-300V,Measure Current Range 0.2-99.9A ..